Channel 5's Thomas Week may be over, but the reviews keep on coming. Start Your Engines! 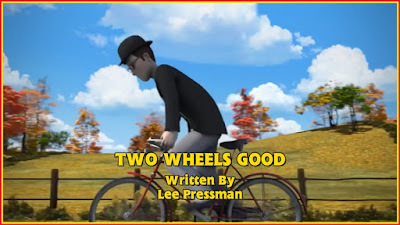 came out on DVD on Monday, so it's time to get those six episodes ticked off the review list, starting with Two Wheels Good! Well, this ended up being a surprise! I've wanted more episodes where the focus is more on the roads, and people, of Sodor for quite some time now, and along comes this one to give me both. But what did I think of it? I think it's... alright. It felt a bit petty that they'd all be arguing about "how many wheels is best" when you'd have thought that all of them, somewhere along the way, would have realised that how many wheels you have is irrelevant as long as you get the job done. Also, the addition of Mr Percival was... odd. While it's nice that someone from the Skarloey Railway actually got screen time this series, and it was great that he was at Knapford for a meeting with the Fat Controller, in terms of the story it felt like he was only at the station to say "I'll be an important part to the story's resolution". And he was. With no explanation as to why he was going that way. In fact, neither Thomas or Bertie had any real reason to go to Callan Castle other than plot convenience. At least Mr Percival might have had the excuse that he was going to the ball as well, and Harold's appearance makes sense as he was told off screen where Bertie had broken down, but Bertie and Thomas? Nothing. It would've been acceptable if they were taking people to the ball as well, but the bus and Annie were both empty when the Duke and Duchess boarded. That said, I like the story. Troublesome travel is something that, at least, adults can sympathise with (I know I can after last Thursday, but that's another story), and the dialogue is definitely some of the most entertaining of series 19 thus far. I also love the look of the country roads. They feel really natural for the kind of setting the Awdrys imagined, and the one that the current team are trying to respect and be inspired by. Also, Lord Callan was great. His part was small, which was a shame, but his render is fantastic and his voice is great as well. I know that Keith Wickham gets a lot of stick for voicing so many characters, and I understand it completely, but it doesn't take away the fact that he's a really good voice actor. This episode has its problems, but I still like it. The story's good, it has enough entertainment value to keep you interested and it's nice that they took a bit of time away from the railway. Fingers crossed that it's not for the final time..!